And thus starts SMAK's series featuring Mercadito Hospitality. Over the next few months SMAK will be taking a look at each of the four Chicago Mercadito restaurants - Mercadito Fish, Mercadito, Mercadito Counter and Tippling Hall. We start by giving thanks for the incredibly delicious brunch menu at Mercadito Fish - seriously, I am still dreaming of their smoked salmon and fresh greens. Last Saturday morning my friend and I made our way to Mercadito Fish on perhaps the first insanely cold day of the year. Chicago winter? I am not convinced that I am ready to face your cold winds and harsh snow storms. But alas, Mother Nature will do as she pleases. As we took our first sips of coffee, I was hit by my first bout of holiday spirit. I am so thankful for having the opportunity to live in Chicago. To work with incredible restaurants like Mercadito. To have friends and family live in such close proximity. But more than anything, in that moment, I was thankful for the brunch that I was about to partake in. Juicing - love it or hate it. I am a huge advocate for this "trend," if it can still be called that. Perhaps I am strange for liking the flavors of kale, celery, parsley, and lemon, but find me at brunch and you better believe I will have a glass of juice next to my cup of coffee. This may in fact be my favorite dish on the menu. I am so accustomed to bagels and lox. While this is similar in theory, the execution and idea of putting smoked salmon atop crisp hash browns rather than a bagel blew my mind. The subtle crunch of the browns with the richness of the salmon and the light freshness of the greens was the perfect combination. Throw a little Mexican inspiration into the mix and I began seeing resemblance of the other Mercadito restaurants. The kick of spice was a great contrast and change of pace from the first dish. Classic brunch fare - the frittata was done perfectly with just the right balance of cheese, peppers, tomatoes and spinach. Not one ingredient overpowered the others. The house potatoes made me smile, thinking about eating breakfast at diners in New York City. And again, the phenomenal fresh greens (Jennifer and I developed an insane obsession with these greens throughout our meal). I have had my fair share brunches both here in Chicago and in other cities in and outside the US. In terms of dining out, it may be my favorite meal to eat out. So when I come across a restaurant that hits every note with such perfection, it would be hard to forget. While I am excited to see the upcoming changes being made to the menu (in hopes of bringing more of a connectivity to other Mercadito restaurants), I was incredible impressed with the overall experience. What made the morning far exceed my exceptions was the service that the waiters gave the guests. Every single waiter in the restaurant was attentive and caring towards their guests. 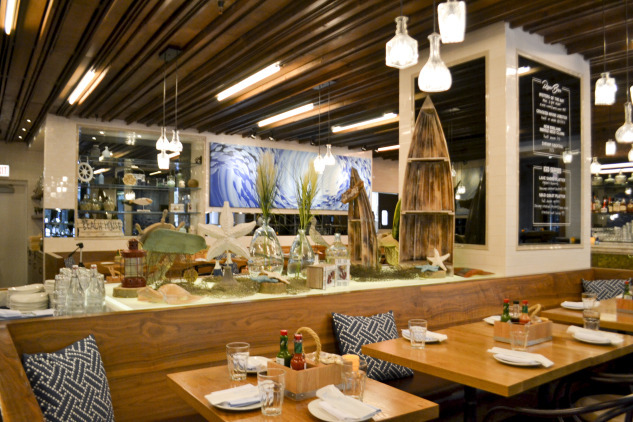 As we approach Thanksgiving, take a morning out of your busy week to head on over to 10 E. Delaware and enjoy a little brunch at Mercadito Fish. Or if you'd like, try out their Thanksgiving menu for dinner!